Bookmans is a wonderland of books, music, movies and media. So, it isn’t surprising that there are certain sections in our stores that some folks have yet discovered. Today, we focus on our New Age book section. More specifically, we’re delving into the art of Reiki. Reiki is a healing technique based on the principle that therapists can channel healing energy into the patient by means of touch. This form of natural healing is very spiritual (yet has no religious attachments) and has been known to help physical pain, insomnia, stress reduction, depression, and much more. This control of healing energy can also be used in daily activities. Some use the technique while gardening, cooking, during pregnancy, studying, and even with electronics. Reiki functions on a physical, mental, and emotional level. It is an unlimited form of spiritual healing energy. This healing energy is passed through gentle static light pressure touch and has also been known to work over long distances. It’s all about sending those good vibes! A man named Doctor Usui traveled from culture to culture searching for a way to heal the earthly body the same way many great Prophets had in the past. After spending twenty one days fasting and meditating on top the holy mountain of Mount Kurama, he supposedly had a great vision. A message was sent to him written in Sanskrit (an ancient language of India) that enlightened him on the healing methods he was looking for. Usui then returned to society and began performing and teaching the healing method he discovered. He taught Reiki to over two thousand people in just five years. Today Reiki is widely practiced as its own healing method as well as a supplement to other healing modalities like yoga and massages. There you have it! 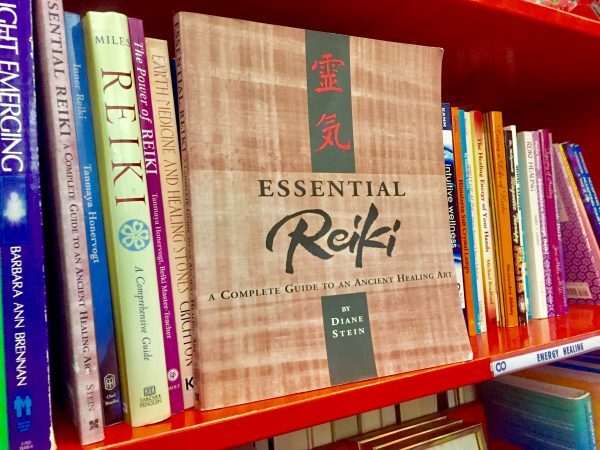 To check out all of the art of Reiki, keep your eyes peeled for these and other books in our stores or by calling one of our Bookmans locations. We also suggest to ask or check out our employee recommendations, our shelves as our selection is always changing. *Bookmans is your store to explore. We can’t guarantee stock, so if you are interested in one of the books mentioned, please give us a call and we’ll check our orange shelves for you.